With the ever increasing costs of running a car, more individuals are using bicycles as a cheaper and healthier mode of transport. The increase in cyclists on the roads inevitably leads to an increase in accidents between vehicles and cyclists. Based on official accident statistics for the year 2014, there were 3,401 seriously injured cyclists and 113 fatalities. Driving examiners are aware of this and can be particularly strict on how learners deal with cyclists during a driving test. As a high number of driving tests are failed due to learners driving inappropriately or unsafely around cyclists, this section deals with the correct method of driving among cyclists. Whilst this guide may seem a little harsh on the inappropriate riding of some cyclists, it’s essential that a learner driver is taught not only how to correctly drive in and around cyclists, but to also be prepared for those few unpredictable and potentially dangerous cyclists. Whilst motorists can be equally inconsiderate and dangerous as a cyclists, this article focuses on cyclists only. Advanced stop lines or cyclists waiting areas are often located in busy areas at light controlled junctions. Often incorporated into the driving test, all vehicles including motorcycles should keep the cyclist waiting area clear by stopping just before the first white line. If your vehicle has passed over the first solid white line which can be common in slow moving traffic and the traffic lights change to red, you must stop before the second white line and wait in the cyclist waiting area. Although stopping in the cyclist waiting box is the correct procedure to avoid running a red light, it is still likely to fail a driving test. 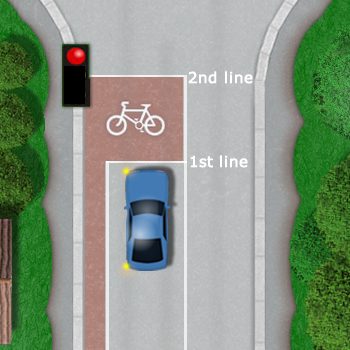 To minimise the likely hood of having to stop in the cyclist waiting box when in slow moving traffic, ensure there is enough room for your vehicle to safely clear the junction before proceeding into the cycle waiting area by waiting at the first white line until clear. This action may cause impatient drivers behind you to sound their horn, but will ensure you do not fail the driving test for either stopping in the cyclist waiting area or blocking the junction. Cycle lanes have either a solid or dashed line to right side of them. 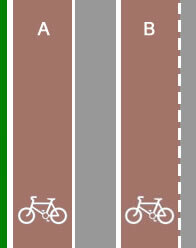 Cycle lane A: Solid line – vehicle drivers are not permitted to cross a solid line. 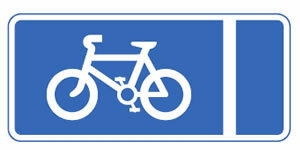 Cycle lane B: Dashed line – vehicles are permitted to cross this line into the cycle lane. Cycle lanes are coloured either red, green or have no colouring at all other than the colour of the tarmac itself. During a driving test, whether the line is solid or dashed, try and avoid driving in a cycle lane if possible. It is on occasions necessary to drive in a cycle lane, even if it has a solid line. If for instance there is a large vehicle coming towards you on the opposite side of the road which may require extra road space, or there is a inappropriately parked vehicle on the opposite side of the road causing traffic to move around it, these situations may require that you drive into the cycle lane. If during a driving test you see an approaching hazard and feel it is necessary to drive in the cycle lane, whether it has a solid or dashed line, check the main interior mirror, followed by the left wing mirror and look into the left blind spot to ensure no cyclists are in the lane before moving over. Providing adequate safety measures are taken before taking a cycle lane, the examiner will find this acceptable. Whilst driving in general or during a driving test, extra caution should be taken around cyclists. Although most cyclists follow the Highway Code, a few don’t. If an incident occurs between yourself and a cyclist during a driving test, regardless of who’s fault it was, the examiner will see it as your responsibility to either have prevented or to have taken evasive action. Cyclists can be unpredictable and certain areas should exercise caution. Approaching any form of junction. These include roundabouts, mini roundabouts T-junctions or crossroads. Cyclists can often change direction at the last moment, leaving a car driver little time to react. Cyclists may possibly not signal their direction change before doing so and unbelievably, certain cyclists may not even look to see if it is safe before doing so. If you are approaching a junction and a cyclist is in front, depending on the circumstances it may be safer to hold back behind the cyclist. Many driving tests are failed due to learner drivers being to eager to get past cyclists. If you are reasonably near the junction, 10 metres or so, hold back, unless to road is particularly wide. The driving test will of course involve making left turns on many occasions. Cyclists can be particularly vulnerable here. Even if a vehicle is clearly signalling to the left, a cyclist may not slow down and let the vehicle make the turn. The examiner will expect you to make a final check of the left mirror just before making a left turn. A check of the left blind spot may also be necessary in busy areas just to ensure a cyclist is not to the left side of your vehicle before turning. Narrow roads and streets can be particularly hazardous for cyclists. If you are approaching a cyclist, think about any potential hazards. You will need to give a cyclist at least 1 metre passing distance, so can this be done safely? Is there a bend in the road that you cannot see around? Is there parked cars up ahead that both you and the cyclist need to clear? Don’t be afraid to hold back behind the cyclist in in doubt. Wait till you are absolutely sure it is safe for both you and the cyclist and to provide a safe passing distance before proceeding. Cyclists are permitted to ride across Toucan Crossings but should dismount before crossing a Zebra Crossing. Unfortunately this isn’t the case with all cyclists and leaves drivers very little time to react safely. When approaching a Zebra Crossing, of course you need to be observant of pedestrians, but also keep a keen eye on any cyclists, especially very young cyclists who may disregard or be unaware of pedestrian crossing rules. Another common aspect of a cyclists unpredictability can be to ride on the pavement and without any regard for drivers or their own safety, move onto the road. This can be dangerous for the cyclist if they move too far into the road into a vehicle and can be dangerous for vehicles as it can cause a driver to swerve or brake. Be cautious, especially of younger cyclists who are riding on the pavement. Whilst passing them, try to allow a little extra distance in case they decide to move onto the road. This may be more likely to happen near a dropped kerb. Before changing a lane, the appropriate blind spot must be checked. An entire car can easily be concealed in the blind spot, not to mention a cyclists. The driving test involves a great deal of moving off and stopping. Before driving off from a stationary position, use the correct mirrors, signal and the right side blind spot. Forgetting this can be dangerous for cyclists and will almost certainly fail a driving test. Cyclists can often emerge from a junction on your left as you are approaching. They can frequently take a wider turning angle than they perhaps intended, directly into your path. 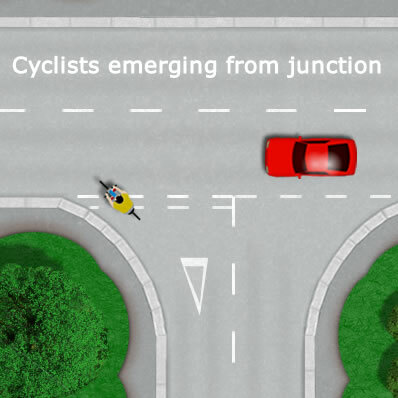 Keep a keen eye for cyclists approaching junctions to your left and allow them extra room. During a driving test, drivers will be expected to take a reasonable level of unpredictability from cyclists into account and although this can be attributed to bad or inconsiderate riding, weather and road quality also play a part. I drive in Bristol regularly, visiting clients around the city three days a week.and voluntary work in the evenings when it is dark. I am shocked each time I go out at the dangers cyclist present to themselves and all road users as well as pedestrians by being ignorant or ignoring their responsibility to make themselves visible on the road whether stopped or moving. This topic is a constant topic of conversation with friends who also drive and like me use cycles too. Why do we not have legislation in place to ensure cyclists where appropriate clothing and take appropriate steps to safeguard themselves and everyone else? I, like you are a driver and regularly cycle too. Problem is, many of our roads simply weren’t designed with the huge amount of traffic, including cyclists in modern times. In my opinion I think cyclists should undergo some form of test along with an update of legislation. Though the reality of putting that into practice and policing it could be a different matter entirely.